The Lokpal Bill has been referred to the standing committee of Parliament on personnel, public grievances, law and justice. In this FAQ, MR Madhavan explains the process of these committees. What is the role of such standing committees? The system of departmentally related standing committees was instituted by Parliament in 1993. Currently, there are 24 such committees, organised on the lines of departments and ministries. For example, there are committees on finance, on home affairs, on defence etc. These standing committees examine Bills that are referred to them. They also examine the expenditure plans of ministries in the Union Budget. In addition, they may examine the working of the departments and various schemes of the government. How is the membership of these committees decided? Each committee has 31 members: 21 from Lok Sabha and 10 from the Rajya Sabha. Parties are allocated seats based on their strength in Parliament. The final membership is decided based on the MP's area of interest as well as their party's decision on allocating the seats. Of the 24 committees, 16 are administered by the Lok Sabha and the eight by Rajya Sabha. The chairperson is from the respective House. Political parties are allocated the chairs based on their strength in Parliament. Some committees such as home affairs, finance and external affairs are customarily chaired by a senior member of an opposition party. What will the standing committee do with the Lokpal Bill? The committee has invited comments and suggestions from the public on the Bill. Comments can be sent to KP Singh, director, Rajya Sabha Secretariat, 201, Second Floor, Parliament House Annexe, New Delhi 110001. These may also be emailed to kpsingh@sansad.nic.in or rs-cpers@sansad.nic.in. The committee will examine the written memoranda. They will also invite some experts and stakeholders for oral evidence. Based on its examination, the committee will prepare a report with its recommendations on the various provisions of the Bill. This report will be tabled in Parliament. Is the report decided by voting? No. The committee tries to form a consensus while preparing the report. However, if some members do not agree on any point, they may add a dissent note. For example, the committee on the Civil Liability for Nuclear Damages Bill had dissent notes written by MPs from the left parties. The Women's Reservation Bill also had dissent notes from a couple of members. Are the committee's recommendations binding? No. The committee system was formed recognising that Parliament does not have the time for detailed examination and public feedback on all bills. Parliament, therefore, delegates this task to the committee which reports back with its recommendations. It is the role of all MPs in each House of Parliament to examine the recommendations and move suitable amendments. Following this, Parliament can vote on these amendments, and finalise the Bill. Can you give examples when the committee's work has resulted in significant changes? There are many such instances. For example, the standing committee on science and technology examined the Civil Liability for Nuclear Damages Bill. The committee made several recommendations, some of which increased the potential liability of suppliers of nuclear equipment in case of an accident. All the recommendations were accepted. Similarly, the Seeds Bill, which is currently pending in the Rajya Sabha, has seen several major recommendations by the committee on agriculture. The government has agreed to move amendments that accept many of these recommendations. Are all Bills referred to standing committees? Most Bills are referred to such committees but this is not a mandatory requirement before passing a Bill. In some cases, if a Bill is not referred to a committee and passed by one House, the other House may constitute a select committee for detailed examination. 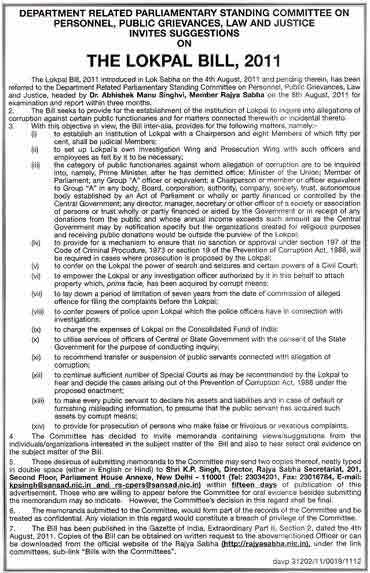 Some recent examples include such select committees formed by the Rajya Sabha on the Prevention of Torture Bill, the Wakf Amendment Bill, and the Commercial Divisions of High Courts Bill. There are also some instances when a Bill may be passed without the committee process. Is it a good idea to bypass the committee process? In general, this process provides a platform for various stakeholders to provide their inputs. In the Lokpal case, a few influential groups such as the India Against Corruption and the National Campaign for People's Right to Information have voiced their views. However, there may be other points of views of persons who do not have similar access to the media. The standing committee provides equal opportunity to everyone to write in their memoranda. It also allows parliamentarians to devote a significant amount of time to understand the nuances of a Bill and make suitable modifications. Thus, the standing committee system is an opportunity to strengthen legislation in an informed and participatory manner. 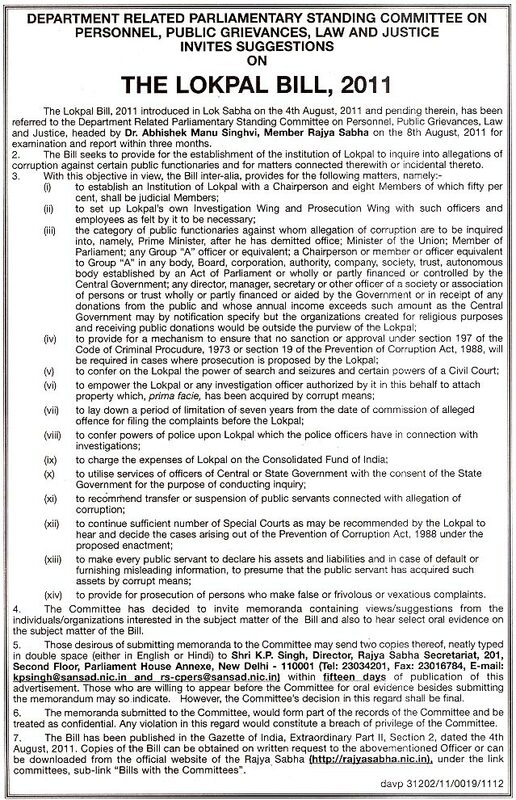 Is it feasible to compress this process within 10 days and get the Lokpal Bill passed within the current session of Parliament? There should be sufficient time for citizens to provide inputs to the committee. The committee has to examine the different points of view and find suitable provisions to achieve the final objectives. For example, there are divergent views on the role of Lokpal, its constitution, its jurisdiction etc. The committee has to understand the implications of the various proposals and then make its recommendations. It has been given three months to do so. Typically, most committees ask for an extension and take six to eight months. It is not practical to expect this process to be over within 10 days. Should civil society demand that the government issue a whip and pass the Jan Lokpal Bill? Everyone has the right to make any demand. However, the government is duty-bound to follow the Constitution. Our Constitution has envisaged a Parliamentary system. Each MP is expected to make up their minds on each proposal based on his/her perception of national interest and people's will. Indeed, one may say that the best way to ensure a representative system is to remove the anti-defection law, minimise the use of whips, and let MPs vote their conscience. That may give us a more accountable government.